This term, Dr. David Webster is trying something new. “This year’s textbook [is] written by previous years’ students,” he announced over Twitter, much to the excitement of his followers. Dr. Webster has taught his students at Bishop University how to contribute to Wikipedia as a classroom assignment for a few terms now. 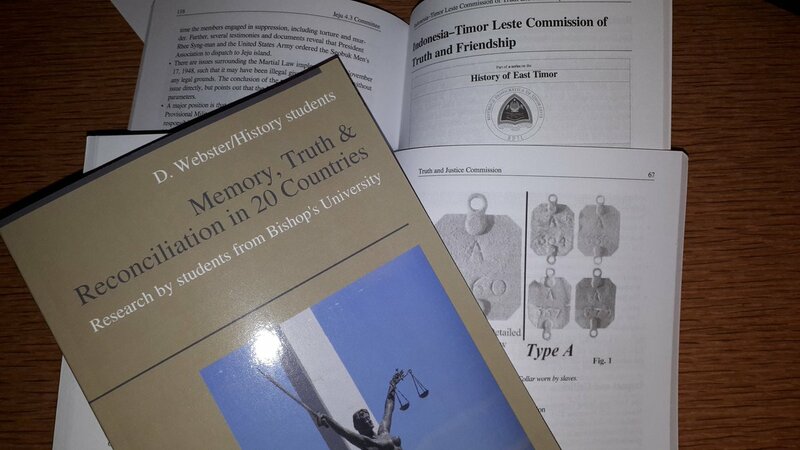 In his Spring 2016 course, Memory, truth and reconciliation in the developing world, students created new Wikipedia articles on a variety of course-related topics, including Truth and Reconciliation in Cambodia and the International Commission of Investigation on Human Rights Violations in Rwanda since October 1, 1990. 16 of these articles, along with 4 from a 2014 course, are included in a new textbook resource for Dr. Webster’s students to utilize this term and beyond. The textbook that students will be referencing this term (along with other course materials and readings), written by former students. Wikipedia is a unique platform through which to engage students. They learn to collaborate with each other and with other Wikipedia users as they distill course topics into concise, well-researched, heavily cited articles for the general public. The exercise strengthens research, writing, collaboration, and digital literacy skills – all while providing a public service. Students make academic information (often restricted behind paywalls) available to anyone with internet connection worldwide. Wikipedia is the ultimate open educational resource. Students tend to be more motivated to produce quality work when they know their work can make an impact beyond their course. We’ve received such feedback from instructors and students alike that seeing the measurable impact of their work on Wikipedia makes a difference. And the passion that the assignment can inspire also has the power to live on beyond the term. Haleigh Marcello at the University of California in San Diego, for example, shared why she found contributing to Wikipedia to be such a “rewarding and fun experience,” and one that she’ll continue to pursue. Similarly, Jane Lee came back to update her Wikipedia article months after her course at Washington University in St. Louis ended and shared how proud she was to work toward a better final product. Interested in teaching with Wikipedia? Visit teach.wikiedu.org to get started, or reach out to contact@wikiedu.org with questions. Image: File:A course textbook for History & Global Studies 228, Bishop’s University.jpg, Dwebsterbu, CC BY-SA 4.0, via Wikimedia Commons. How do I access a copy of the book?